Sushi has become very popular and for people that just can't get enough sushi, trying to make their favorite dishes at home sounds interesting and that is where a sushi kit can help. But what is a sushi kit exactly? What do you get with a kit and how much do they cost? That's exactly what we are going to discuss on this page. 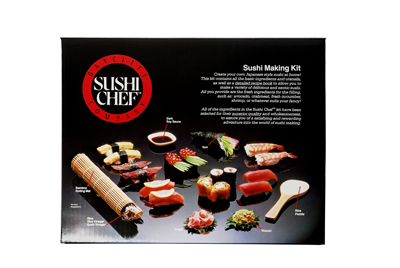 A sushi kit is simply a package that contains all of the various things you will need to make sushi at home. It's a great option for someone that doesn't have any experience making their own sushi because you will have all of the tools and some of ingredients you will need and you may even get a book with detailed instructions telling you exactly what to do. Having a sushi kit and preparing your own sushi at home can also help you save a lot of money because it will be a lot less expensive to buy all of the ingredients and prepare things yourself than it would be to go to a sushi bar. 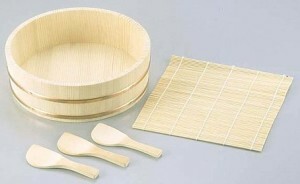 A typical sushi kit might include a bamboo rolling mat, a bamboo rice paddle, and an instruction book. You might also expect to find a serving plate, reusable chopsticks, and dipping bowls for various sauces and condiments. A kit might also include nonperishable food items such as rice, vinegar, soy sauce, etc. You can find sushi kits at a number of different price points and the price depends on the quality of the pieces and ingredients in the kit as well as the number of pieces the kit includes. For example, with a little bit of research online we found a 3 piece sushi kit for under 10 dollars. 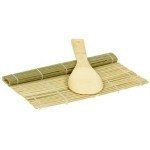 This particular kit contained a bamboo rice paddle, a bamboo rolling mat, and an instruction booklet. On the higher end of the price range we found a sushi kit that included a bamboo rice paddle, a bamboo Maki rolling mat, various utensils, Nori (toasted seaweed sheets), rice vinegar, sushi vinegar, premium dark soy sauce, premium sushi rice, pickled ginger, wasabi, and a detailed recipe book. As you can see the more expensive kits will contain more items and also higher quality items. You are also likely to get a more detailed instruction/recipe book with a more expensive kit. An inexpensive sushi kit might have a small pamphlet with a few pages while a more expensive kit may have an 80 page book with detailed instructions for making a full menu of sushi favorites. 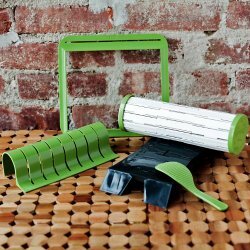 To read more on other cool sushi kits -> click here for funky sushi making kits.